So many veterans were with us; and we went to many places off limits to others. Our 1999 “Patrol in North Germany” began as do all our ‘Patrols‘ in that area – with a cruise of the Hamburg Harbor in our own chartered boat. This is an ice breaker where our participants can meet each other as well as the German veterans who take this cruise with us. There is an honors bar where we can buy soft drinks, wine and beer as we see this centuries old harbor – cameras clicking all the while. After our ‘Harbor Patrol’, we returned to our hotel to freshen up. This hotel is owned by a Knights Cross winning U-Boat Skipper, Captain Otto Westphalen, and so we are treated as family. In the evening, we enjoy our Welcome Banquet where we are joined by a great many U-Boat Skippers, officers and crew. After the dinner, all are happy to sign autographs. Some of our honored guests. From the left they are: Leutnant Adolf Schmidt; Skipper of an AA Flak boat in the English Channel; Fregattenkapitän Gerd Thäter, Skipper of U-466 and U-3506; Oberleutnant z.S. Otto Westphalen, Skipper of U-968, Knights Cross; Oblt z.S. Matthias Brünig, Skipper of U-108 and then a training Skipper; Oblt z.S. Günther Heinrich, Skipper of U-960, the last boat through Gibraltar; Volkmar König, midshipman on U-99 under Kretschmer. Sharkhunters President Harry Cooper is at the right. Our deluxe motorcoach greets us on Monday and we enjoy a short ride through the German countryside to Laboe, a suburb of Kiel, where we spend time at the German Navy Memorial and also U-995. This is the only Type VII-C U-Boat left in the world, and we always have the pleasure of her former Skipper with us to tell us about his five war patrols. Our very good friend and SHARKHUNTERS Member Captain Hans-Georg Hess (Knights Cross) is always glad to have us aboard his old boat. At barely 21 years of age, Hess was the youngest combat submarine Skipper in any navy in World War II, possibly in all of history. A small part of our group assembles by U-995. The rest are still aboard. Our lunch is at the quaint Seeterrassen Restaurant across the road from U-995 and we enjoy our meal with these great veterans at our tables. After lunch is one of the high points of this tour – we were joined by a lead engineer of HDW (Howaldt-Deutsche Werft) It was a great seminar and he gave us all the specifics on the top secret 212 Class German submarine AND the super secret 214 Class. Tuesday morning finds us at another place where SHARKHUNTERS and very few others are welcome; the fantastic Naval Museum of SHARKHUNTERS Member Peter Tamm. This museum is not open to the public, but our groups are welcome. This is probably the most fully complete naval museum in the world and the quality and presentation of the exhibits are unequaled anywhere in the world. The sheer number of items in each exhibit is overwhelming. It is a fantastic place! We then visited the grave of GrossAdmiral Karl Dönitz and placed flowers there. It is a beautiful but sad spot, and at his feet are two stones to remember his two sons who died in World War II. Then our motorcoach rolled westward for about an hour to our new hotel in Bremen, but we stopped at a little restaurant along the way where we could each try our hand at ordering German food off the menu. It worked quite well, and everyone was happy with their menu selections. Naturally, our veterans helped. Below is the breakfast spread each morning at our hotel in Bremen – outstanding! Next morning, after a leisurely and sumptuous breakfast at our hotel, we went to Steinhuder Meer for our boat ride to the fortress castle Wilhelmstein, where the first German submarine was tested more than 200 years ago. We walked through the castle, had snacks at the little outdoor cafe, then back to shore where we had a short visit at a very special shop. We could buy genuine Third Reich artifacts from this shop. Our next stop was at Bordenau and the ancestral home of General Scharnhorst. This is a private home where a direct descendant of the General is living today. She is a friend of ours and opens this place for us to visit. She also has her cook prepare some of the best pea soup in the world! Our Member Phil Waite set a new SHARKHUNTERS record here by eating seven large bowls of this great soup – and that was after he had a huge sandwich. Who will better Phil’s record on another ‘Patrol’? We’ll see. We then went to visit a beautifully restored Ju 52 that participated in the Norway Invasion. She landed on a frozen lake and with the spring thaws, she and about a dozen other ‘Alte Tante Ju‘ aircraft sank to the bottom. This one is magnificently restored. There are many other vintage aircraft on the grounds, and we were given free rein to go around AND through them all. Thursday was a day at the beautiful Luftwaffe Museum in a nearby town, and the Director of the Museum closed it to the public for the morning we were there. We were given free run of the museum, and there were Luftwaffe veterans there to visit with us and when we had our lunch there in the museum, they joined us for that too. The afternoon was at leisure back in Bremen, so many of our group took the short bus ride to the old center of the city for souvenir shopping. Friday found us in Wilhelmshaven, where we had a short tour of the Wilhelmshaven Navy Base then to another spot where we visited a 205 Class submarine of the German Navy as well as other craft. For lunch, we retired to a quiet little spot planned by our friend and Member, Gerd Thäter. Gerd was the Skipper of U-466 (Type VII-C) and U-3506 (Type XXI) during the war, and this day he brought many of his crew and other Skippers to have lunch with us. We had a great time and as always, the veterans signed autographs. Friday evening was our Farewell Dinner, as we have only a couple days left on our ‘Patrol’. We rented out a very exclusive country club for this great dinner and naturally, were joined by many more veterans and of course, they all signed autographs freely. We certainly ate well on this ‘Patrol’. Most of us went home a little heavier than when we arrived. On Saturday morning, we visited a very special German Navy facility that is off limits to even most German Naval personnel. We can neither describe it nor show photos of it, but we got a great slide presentation of this place during World War II then a guided tour. We then headed to Bremerhaven and the waterfront there. We had lunch at our pick of the sidewalk cafes there, then toured at our leisure aboard U-2540, the only Type XXI boat left in the world. There were other vessels to visit as well, and we toured them all. Our group in Bremerhaven – you can see the Type XXI boat to the right. Then we were back to our hotel for our final night in Germany. This time was at leisure so people could visit with new friends, do some final souvenir shopping, reflect on the fantastic places they had gone and the wonderful people they had met. In the morning, our motorcoach took us to the airport and we were on our way back to our home countries with great memories and a lot of photos. SPECIAL THANKS to our SHARKHUNTERS Members in Germany who were instrumental in preparing this wonderful “Patrol in North Germany“. 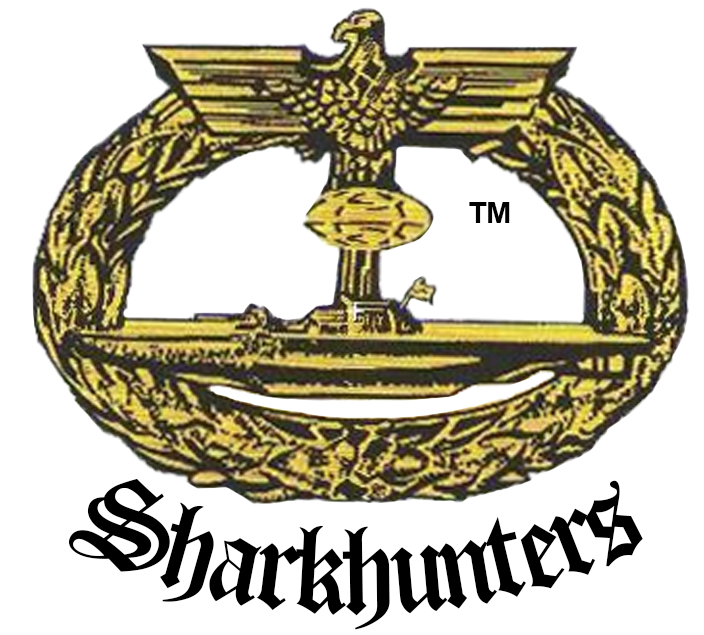 They are all veterans of the U-Bootwaffe and the Luftwaffe, and so that is why our SHARKHUNTERS ‘Patrols‘ are so unique. Vielen Dank meine freunde!